We believe our product is better, but let’s be clear: K9Grass is a solid second place. If you’re unable to get PetGrass or simply need more options, K9Grass is a much better option than shoddy knock-offs or regular turf that is either filled with special infills like Zeolite or sprayed with expensive enzymes to control the odor. Zeolite and other infill based solutions are ineffective at best and counter-effective at worst, as they retain all the wrong types of moisture and increase maintenance. Enzymes not only have a higher maintenance level than PetGrass OR K9Grass, but are expensive. The following article is meant to give you the facts on why we believe PetGrass is better than K9Grass, and so in the interest of a healthy turf community and pet safety (avoiding possible ammonia hazards) we want to make sure you’re armed with ALL the facts. Not just those that benefit us. Customers think that Perfect Turf® PetGrass® is the better looking product. It’s thicker, tougher turf that will feel better for people and pets alike. The increased dimensional stability of PetGrass® looks better for longer than K9Grass, so smart businesses like Camp Bow Wow pet hotel chain use Perfect Turf® PetGrass®. Don’t take our word for it, ask for samples of PetGrass® and K9Grass and compare them yourself. 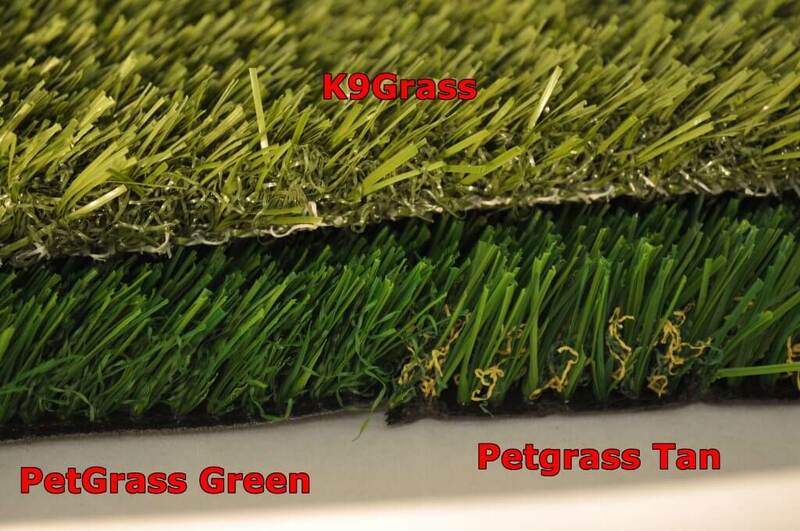 We’re confident you’ll choose PetGrass® when you see both products. K9Grass has a higher drainage rate than PetGrass®. That’s a fact, but don’t take that to mean that PetGrass doesn’t have enough drainage for even the most well-hydrated doggie facility. Another factor to drainage is the material beneath the canine grass. If you’re placing your artificial turf outdoors on top of crushed rock, both brands of turf will drain faster than the ground beneath the turf. There is also a drawback to the flow-through backing K9Grass is known for: Runny feces. Dog facility owners have complained to us about flies gathering over areas dogs have taken a runny doo. They can simply wash it through PetGrass, but the chunks will get stuck in the mesh of the K9Grass and need to decompose there. K9Grass has anti-microbial agents built into the yarn to prevent odor buildup. Perfect Turf® PetGrass® uses advanced manufacturing technology to incorporate powerful anti-microbial agents into the yarn and a second type of specialized anti-microbial additives into the backing of the turf for complete odor protection. 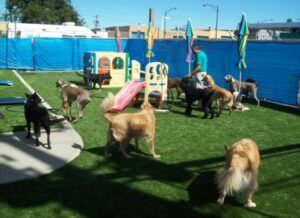 Customers say PetGrass® has a lower price point than K9Grass of similar face weight. Perfect Turf® brand synthetic turf provides the best value for your money in the synthetic turf industry. Ready for a quote? Want to ask some questions? Anything else? Contact us!